ATTRIBUTED TO DEXAMENOS OR A CLOSE FOLLOWER, CLASSICAL PERIOD, CIRCA LATE 5TH CENTURY B.C. Giorgio Sangiorgi (1886-1965), Rome, acquired and brought to Switzerland, late 1930s; thence by continuous descent to the current owners. C. Weiss, "Heuschrecken auf griechischen Vasen und in der Glyptik," in Corpus Vasorum Antiquorum, Beiheft 2, Vienna, 2015, pp. 299-300 and 306, fig. 2. 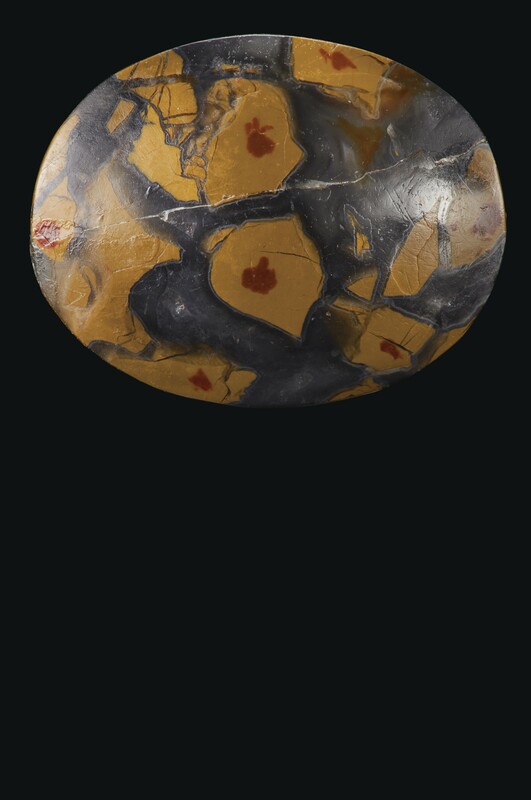 J. Boardman and C. Wagner, Masterpieces in Miniature: Engraved Gems from Prehistory to the Present, London, 2018, p. 62, no. 54. This meticulous study of a grasshopper on a grass stem amidst its leaf blades is a masterpiece of the gem engraver's art. The finesse and delicate details are likely the result of an advancement in lapidary technology-- namely the use of the diamond point drill-- which seemingly first occurred during the 5th century B.C. This afforded the engraver the ability to cut freeform, allowing for a level of naturalism in the details not previously possible. Note in particular the insect's veined wings. 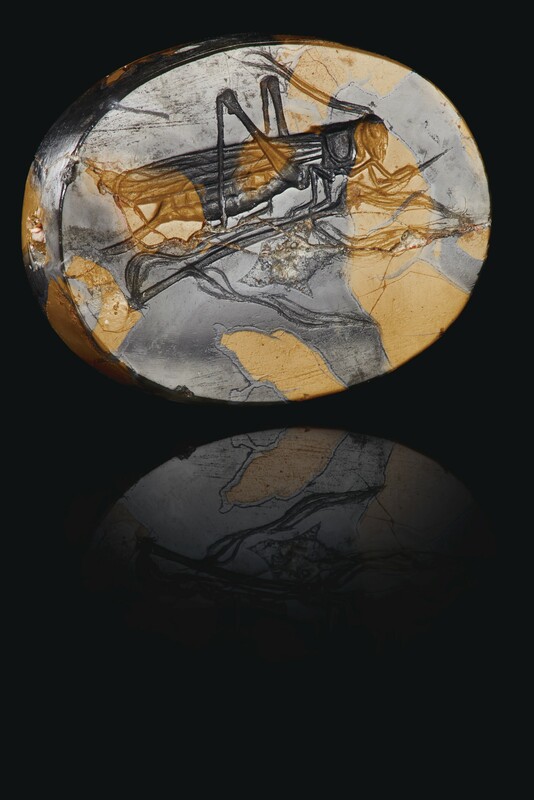 The exceptional quality of the engraving in combination with the choice of unusual mottled jasper suggest a connection to the gem engraver Dexamenos of Chios, whose signature is found on four gems (a profile male head, a domestic scene, a heron, and another heron with a grasshopper, pls. 466-469 in Boardman, Greek Gems and Finger Rings). Several of the signed gems are on mottled jaspers, as are the related gems attributed to him. A similar grasshopper on a sheath of wheat on a carnelian scarab in the British Museum, while unsigned, is traditionally associated with Dexamenos (pl. 502 in Boardman, op. cit. ).